The most intuitive and easy-to-use ethics reporting and case management system in the marketplace today! 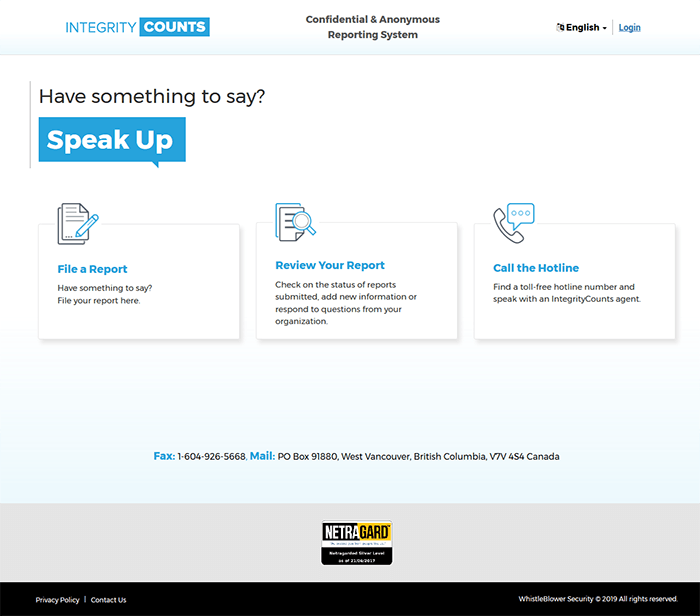 WhistleBlower Security has released a system upgrade to its IntegrityCounts Case Management platform, modernizing the look and feel to encourage reporters to speak up and make it even easier to manage cases in your organization. We have included screenshots from the new IntegrityCounts, as well as an FAQ below to answer any questions you may have about the new platform. 1. IntegrityCounts looks different. Why the change? 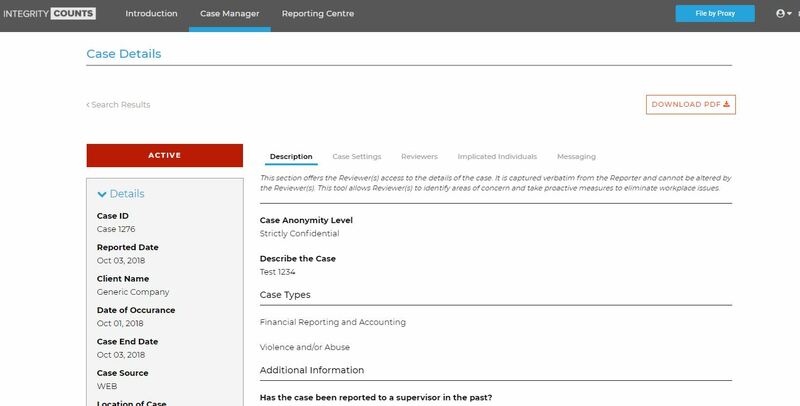 We have modernized the user interface to improve how Reporters and Case Review Managers interact with the system. We have spent a year testing the environment before releasing to our customers to ensure that we improve upon IntegrityCounts' strength as an easy-to-use intuitive software application. 2. Why is WhistleBlower Security upgrading the IntegrityCounts platform? WhistleBlower Security is committed to the innovation of the IntegrityCounts product and providing the best user experience in the Ethics Reporting marketplace. This system upgrade allows WhistleBlower Security to evolve the features in the platform and keep its technology and security protocols current. 3. Are there new features in the new IntegrityCounts? Yes! We have released new enhancements that makes IntegrityCounts even better, including Proxy Reporting, Enhanced Search, and Location-based alerts. In the first half of 2019, we will be releasing Enhanced Analytics, Custom Landing Pages, and Ask A Question features, with more to come throughout the year. 4. When will my company be migrated to the new version of IntegrityCounts? You will be receiving email notifications from WhistleBlower Security notifying you in advance when your company will be migrating to the new version of IntegrityCounts. In addition to advanced notifications, we will be e-mailing you the day before the migration occurs and a confirmation email once you are on the new version. 5. Migration sounds scary. What does it involve? Will we lose any historical data? Migrating your company to the new version of IntegrityCounts is easy. All of your historical data remains untouched and it is simply redirected to the new version. While the platform looks somewhat different, the new version has all of the same fields that you are used to seeing. We have provided training videos to make it easy to learn how to navigate the new version. You’ll be up and running in no time. Training videos can be found here. 6. What if my company customized the IntegrityCounts platform? Will my customizations be seen in the new version? Yes, we have ensured that your customized versions of the software have been migrated to the new platform. Additional quality assurance steps have been taken to ensure that these customizations have been migrated successfully. 7. What if I have issues or questions? Who do I contact? While we are not expecting our clients to have issues, we are here to support you, should you need us. Simply email us at support@integritycounts.ca and we will respond within 24 hours or sooner. Include a brief comment of your question or concern so we can proactively investigate and provide you with the correct information. 8. Does this change how my employees file a report? Nothing changes for your employees. The link employees use to file a report will remain the same. If an employee does happen to arrive in the older version of IntegrityCounts to file a report, as soon as they type in their company name, they will be automatically redirected to the new system and they can continue to file their report.